And a Happy New Year to Leslie and kbculture. People certainly don't dress to cook like they used to. It was perpetual summertime in 1957. You're right about genteel. 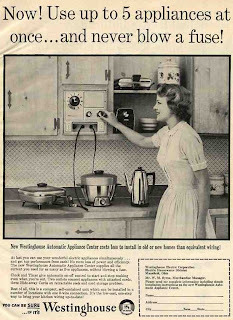 But the appliances themselves haven't changed much. Though hardly anyone perks coffee anymore, the frying pan, the toaster and the waffle maker seem contemporary enough. (We need more waffles in the world.) But the thing in the middle, is it a deep frier, a soup maker? It's not a rice cooker, because they didn't exist yet. It matches nothing in my 50s memory banks. Popcorn makers were a big deal back then — we saw popcorn coming out of a stove a few months ago — though I doubt she's making popcorn. Any ideas? I'm stumped by the same item, evanjones. It's too fragile to be a pressure cooker, isn't it? I'm thinking popcorn—a tasty side dish for whatever is in the electric skillet.